The use of seiners for commercial salmon fishing off Vancouver Island is less a common practice than gillnetting. 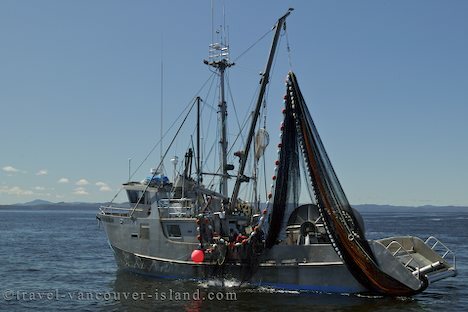 One method of commercial salmon fishing is the use of Seiners, a large net laid out vertically from the back of the boat with buoys at the top and weights at the bottom. Essentially, the fish are encircled by the nets or seiners and hauled onboard by a large drum - in some cases the salmon are kept alive in the boat's hold and delivered fresh. The more common method of commercial fishing seen in the waters around Vancouver Island is Gillnetting. Commercial Fishing off Vancouver Island, British Columbia, Canada. Picture of a commerical fishing boat off the coast of Vancouver Island in British Columbia. Please login or register to rank. Unauthorized use of any images or footage from this site is prohibited by international copyright laws.